Louis L. Moul, Sr., age 85, died March 21, 2017 at Hamilton Manor in Aurora, Nebraska. He was born April 13, 1931 to Nellie (Snipes) Moul and Clifford E. Moul, in Collbran, Colorado. He graduated from Fairmont High School in 1948. Louie married Joan Elaine Campbell November 3, 1949. To this union three children were born. Louie lived most of his life in Fairmont. 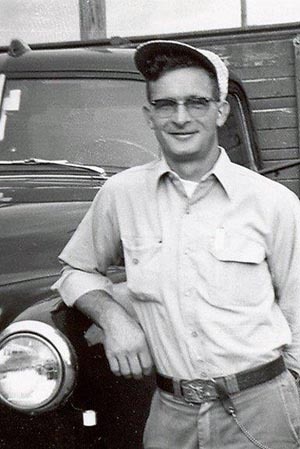 He was respected as a hard worker, owning his own trucking and grain business for many years. He was also employed as a dispatcher, and later owned Parkside Mart in Fairmont. He enjoyed music, especially Lawrence Welk, and dancing, playing cards, and Nebraska Cornhusker football. In his later years, he was still a jokester, enjoying his pranks at the Hoffman gatherings, family of his beloved friend Arlene Eklund. Surviving are daughter Leigh E. (Bob) Moberg of Galesburg, IL and son Louis L Moul, JR (Sheryl) of Longview, WA, grandchildren Zaac (Chelsea) Moberg, Heather (Allen) Smith, Jeff (Molly) Trumble, Andrew Trumble, Ashley (Michael) Wagner, seven great-grandchildren. He was preceded in death by his parents, two brothers Kenneth Moul and Romy Moul, and daughter Susan D. Trumble. Cremation rights will be accorded and a private service will be held at Fairmont Cemetery at a later date. Higby-McQuiston Mortuary of Aurora is in charge of arrangements.